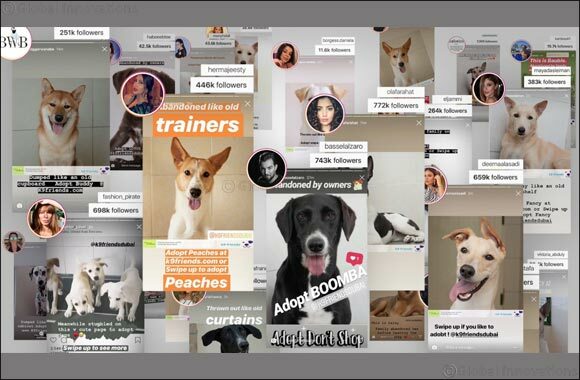 Dubai, UAE, January 31, 2019: The influencer community has mobilized to support K9 Friends get abandoned dogs adopted in Dubai. The initiative is part of K9 Friends' ongoing campaign to help abandoned dogs. The campaign launched over a year ago with provoking ads for ‘second-hand dogs' on Dubizzle. The ads were placed in every classified category from clothing to home appliances, raising awareness about the issue of people abandoning dogs in Dubai. Since then, the campaign has garnered support from some of the biggest influencers in Dubai. Among the celebrity influencers to post about the campaign were TV hosts @BasselAlzaro and @tamara.jamal, @fashion_pirate beauty queen Zeynab, Grazia Style Awards winner @Olafarahat, and many more. Posting on their stories, they told of how these dogs were abandoned like an old couch or worn shoes before encouraging their followers to adopt. K9 Friends have got over 200 dogs adopted in the past year. The issue of abandoned dogs is one that's grabbed the nation's attention. The government has recently passed a law making it illegal to abandon pets in the UAE. Next Story : Looking for a new feline friend to add to your household? Look no further!